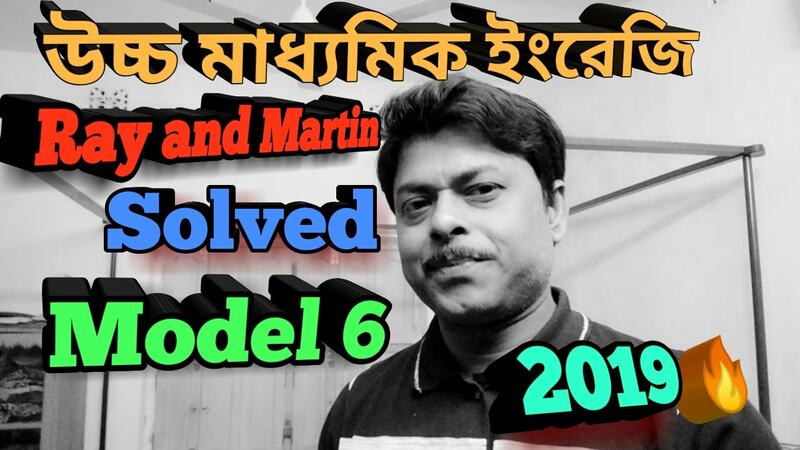 Hi students today we will discuss about some important Answers to the English question bank Ray and Martin solved Model 6. 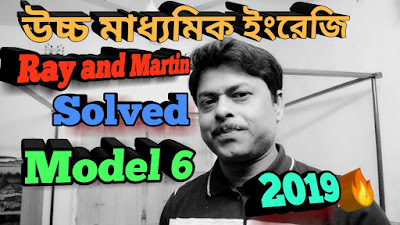 Ray and Martin solved Model 6. Ans : The narrator of Ruskin Bond's story 'the eyes have it' said this to the blind girl who got into the compartment at Rohan Station. the speaker after some casual conversation about the scenes outside become quite daring and made this comment about the girl's face. The girl was amused at this comment and laughed in a clear ringing tone. Then she acknowledged the compliment and added that she had grown tired of hearing that she had a pretty face. Ans : see model 2. Prose section 2. Ans : see the answer of model 2. Prose section 4. Ans : Here the boy refers to Roger, a teenaged orphan boy, who was caught red handed by Mrs Jones in the story' thank you ma'am'. At the end of the story Rodger wanted to thank Mrs Jones for the kind treatment he received and for her guidance and advice which help him to change his Outlook forever. When Mrs Jones dragged him home he had struggled to escape as he feared she would hand him over to the police. But her kind enquiry about his family, her sympathy for his helpless condition astonished him as well as moved him greatly. Mrs Jones did not embarrass him with any personal enquiries. Before leaving she gave him ten dollars to buy blue suede shoes. All these filled Roger's heart with a deep sense of gratitude and he could not find at adequate words to express his feelings at that moment. He only managed to murmur a faint '' Thank you, ma'am'' before the door closed. Ans : see the answer of model 1. Poetry section 1. Ans : keats in his poem '' The poetry of earth'' advocates that winter and summer are not to be taken as opposites. They form the parts of the same wonderful cycle of seasons. Every season bears its own melody. Being exhausted in the excessive intolerable heat of the sun Birds become silent in summer. Then the tiny creature, the grasshopper keeps on chirping marily, as this moves about from hedge to Hedge. When winter steps in, all is - - Icy cold and silent. But Breaking the painful Silence of cheerless winter evening comes the cricket's shrill notes from near the stove. All these prove that poetry and music in nature never perish. And this is the message conveyed by the poet. Ans : see the answer of model 4. Poetry section 3. Ans : The poet Arthur Rimbaud gives a beautiful picture of a valley in his poem 'asleep in the valley'. The vegetation of the valley is nourished by the sunlight and the sparkling waters of the silvery rivulet that flows softly at its will beautifying the valley. The entire Valley looks bright and charming as the sunlight fills up the place. Ferns grow in plenty and the soldier lying asleep in the valley has a pillow of fern under his head. There is also a wide variety of flowers of various colours. Moreover, there are also various species of insects. They sweetly Hum near the soldier. The landscape is so charming that the readers receive a rude shock when he comes to know that the soldier is actually dead. Ans : Lomov and Natalya become engaged in a quarrel for the second time over the superiority of their respective Hunting dogs. Lomov finds that squeezer, chubukov's dog, is overshot. He is good at following but cannot hold a prey as his lower jaw is shorter. Dogs like squeezer are easily available in every bush around and twenty five roubles would have been a handsome price for him. He also curses squeezer. Natalya is Furious to hear this. See indicates that unlike squeezer, Guess does not have any Pedigree at all. He is old and as ugly as a worn out cab horse. It's time that Guess should be shot. Guess is already half dead, so there is no need to hang him. Ans : Natalya , the daughter of chubukov, says this to her father in Chekhov's drama 'the proposal'. It is said when Lomov was driven out of the chubukov's house and chubukov inform his daughter for the first time that Lomov had actually come to ask for Natalya's hands in marriage. Natalya has been unaware of the purpose of lomov's visit to their house because her father had earlier told her quite enigmatically that a merchant had come for his goods. She lustily quarrels with Lomov over property. But when she comes to know about Lomov's proposal, Natalya , who is also desperate like Lomov to get married, feels excited at this unexpected news and despairs that the opportunity is slipping from her fingers. Ans : see the answer of model 2. Proposal 2. Ans : cancer awareness campaign in ABC School. A cancer awareness campaign was organised at the school ground of ABC school on 15th January. The whole ground was surrounded with colourful flags and a stage was built up at the centre of the ground. The BDO of our area inaugurated the campaign. Many free booklets were distributed pedestrians to increase their knowledge of cancer and the process to reduce it. Our Biology teacher explained the fact how cancer develops in our body. He also proposed many ideas to reduce the rate of cancer. He mentioned to reduce air pollution which only can prevent cancer. The campaign ended with a few children reciting a poem of sukanta bhattacharya. Sub: prayer for opening an account. I would like to inform you that I am a new resident of Badu area. I have come here to pursue my higher studies in engineering. As I have to afford a huge money to pursue my studies my father will send me the money to my account every month. As I have no account here I request you to do the same in favour of me. My residential certificate of Badu panchayat area is enclosed herewith.